Definition at line 29 of file GlobalObject.h. Definition at line 40 of file GlobalObject.h. Definition at line 31 of file GlobalObject.h. Definition at line 1393 of file Metadata.cpp. 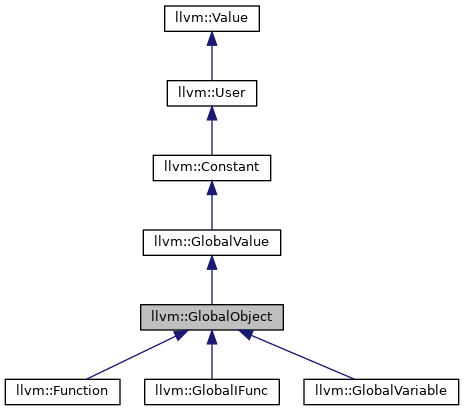 References llvm::MDNode::getContext(), llvm::LLVMContextImpl::GlobalObjectMetadata, and llvm::LLVMContext::pImpl. Referenced by llvm::CloneFunctionInto(), llvm::CloneModule(), llvm::createDeadArgHackingPass(), hasMetadata(), parseOptionalLinkageAux(), and wrapConstantAsMetadata(). Definition at line 1400 of file Metadata.cpp. Definition at line 1494 of file Metadata.cpp. References llvm::ConstantInt::get(), llvm::ConstantAsMetadata::get(), llvm::MDTuple::get(), llvm::MDNode::getContext(), llvm::Type::getInt64Ty(), and llvm::LLVMContext::MD_type. Definition at line 167 of file GlobalObject.h. References llvm::tgtok::Bit, clearMetadata(), llvm::GlobalValue::getGlobalValueSubClassData(), llvm::Value::getValueID(), HasMetadataHashEntryBit, llvm::BitmaskEnumDetail::Mask(), and llvm::GlobalValue::setGlobalValueSubClassData(). Definition at line 1426 of file Metadata.cpp. Referenced by classof(), llvm::GlobalVariable::dropAllReferences(), and wrapConstantAsMetadata(). Definition at line 125 of file Globals.cpp. References llvm::GlobalValue::copyAttributesFrom(), getAlignment(), and getSection(). Referenced by llvm::GlobalVariable::copyAttributesFrom(), llvm::Function::copyAttributesFrom(), and hasMetadata(). Copy metadata from Src, adjusting offsets by Offset. Definition at line 1453 of file Metadata.cpp. References llvm::ArrayRef< T >::begin(), llvm::copy(), llvm::dyn_cast(), E, llvm::ConstantInt::get(), llvm::ConstantAsMetadata::get(), llvm::MDNode::get(), getAllMetadata(), llvm::MDNode::getContext(), llvm::LLVMContext::MD_dbg, llvm::LLVMContext::MD_type, and llvm::ArrayRef< T >::size(). Erase all metadata attachments with the given kind. true if any metadata was removed. Definition at line 1404 of file Metadata.cpp. References llvm::MDNode::getContext(), llvm::LLVMContextImpl::GlobalObjectMetadata, llvm::LLVMContext::pImpl, and llvm::SPII::Store. Definition at line 58 of file GlobalObject.h. References llvm::AMDGPU::HSAMD::Kernel::Arg::Key::Align, llvm::Data, llvm::GlobalValue::getGlobalValueSubClassData(), and setAlignment(). Referenced by canCreateAliasFor(), copyAttributesFrom(), llvm::NVPTXAsmPrinter::doFinalization(), forceRenaming(), getAlignment(), getArrayElements(), llvm::DataLayout::getPreferredAlignment(), INITIALIZE_PASS(), instrumentMaskedLoadOrStore(), maybePrintComdat(), replace(), SRAGlobal(), and llvm::ObjectSizeOffsetVisitor::visitGlobalVariable(). Appends all attachments for the global to MDs, sorting by attachment ID. Attachments with the same ID appear in insertion order. Definition at line 1416 of file Metadata.cpp. Referenced by llvm::CloneFunctionInto(), copyMetadata(), getRetComponentType(), hasMetadata(), hasMetadataOtherThanDebugLoc(), llvm::SlotTracker::initializeIndexIfNeeded(), maybePrintComdat(), and wrapConstantAsMetadata(). Definition at line 100 of file GlobalObject.h. Referenced by canCreateThunkFor(), canRenameComdat(), copyComdat(), llvm::AsmPrinter::emitXRayTable(), llvm::GetOrCreateFunctionComdat(), getRetComponentType(), llvm::TargetLoweringObjectFileELF::getSectionForJumpTable(), llvm::TargetLoweringObjectFileCOFF::getSectionForJumpTable(), hasComdat(), INITIALIZE_PASS(), instrumentMaskedLoadOrStore(), LLVMGetComdat(), maybePrintComdat(), optimizeGlobalsInModule(), rewriteComdat(), and llvm::WholeProgramDevirtPass::run(). Definition at line 101 of file GlobalObject.h. Definition at line 65 of file GlobalObject.h. 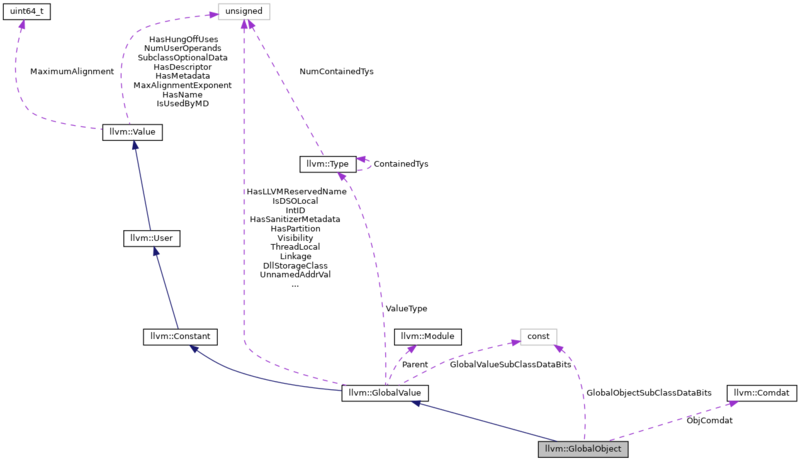 These functions require that the function have at most a single attachment of the given kind, and return nullptr if such an attachment is missing. Definition at line 1443 of file Metadata.cpp. Referenced by llvm::AbstractCallSite::AbstractCallSite(), llvm::WebAssemblyAsmPrinter::EmitFunctionBodyStart(), llvm::AMDGPU::HSAMD::MetadataStreamerV2::emitKernel(), forEachUser(), getAssociatedSymbol(), llvm::getPGOFuncNameMetadata(), hasMetadata(), llvm::GlobalValue::isAbsoluteSymbolRef(), llvm::ImportedFunctionsInliningStatistics::setModuleInfo(), and splitGlobal(). Definition at line 1449 of file Metadata.cpp. Appends all attachments with the given ID to MDs in insertion order. If the global has no attachments with the given ID, or if ID is invalid, leaves MDs unchanged. Definition at line 1381 of file Metadata.cpp. Definition at line 1387 of file Metadata.cpp. If this global does not have a custom section, this will be empty and the default object file section (.text, .data, etc) will be used. Definition at line 89 of file GlobalObject.h. Referenced by callsShareTOCBase(), llvm::FunctionComparator::compareSignature(), copyAttributesFrom(), llvm::NVPTXAsmPrinter::doFinalization(), llvm::AsmPrinter::EmitSpecialLLVMGlobal(), getArrayElements(), llvm::HexagonTargetObjectFile::getExplicitSectionGlobal(), llvm::XCoreTargetObjectFile::getExplicitSectionGlobal(), llvm::AMDGPUTargetObjectFile::getExplicitSectionGlobal(), llvm::TargetLoweringObjectFileELF::getExplicitSectionGlobal(), llvm::TargetLoweringObjectFileMachO::getExplicitSectionGlobal(), llvm::TargetLoweringObjectFileCOFF::getExplicitSectionGlobal(), llvm::TargetLoweringObjectFileWasm::getExplicitSectionGlobal(), instrumentMaskedLoadOrStore(), llvm::RISCVELFTargetObjectFile::isGlobalInSmallSection(), llvm::MipsTargetObjectFile::IsGlobalInSmallSection(), maybePrintComdat(), llvm::WholeProgramDevirtPass::run(), llvm::HexagonTargetObjectFile::SelectSectionForGlobal(), and llvm::HexagonTargetObjectFile::shouldPutJumpTableInFunctionSection(). Definition at line 99 of file GlobalObject.h. Referenced by callsShareTOCBase(), llvm::canRenameComdatFunc(), computeVariableSummary(), llvm::AsmPrinter::emitXRayTable(), forEachUser(), llvm::TargetLoweringObjectFileCOFF::getExplicitSectionGlobal(), instrumentMaskedLoadOrStore(), llvm::needsComdatForCounter(), llvm::LegacyInlinerBase::removeDeadFunctions(), llvm::AlwaysInlinerPass::run(), llvm::TargetLoweringObjectFileELF::SelectSectionForGlobal(), llvm::TargetLoweringObjectFileCOFF::SelectSectionForGlobal(), llvm::TargetLoweringObjectFileWasm::SelectSectionForGlobal(), and shouldRecordFunctionAddr(). Definition at line 105 of file GlobalObject.h. Referenced by emitSignedInt64(), and llvm::stripDebugInfo(). Check if this has any metadata of the given kind. Definition at line 108 of file GlobalObject.h. Definition at line 111 of file GlobalObject.h. References addMetadata(), addTypeMetadata(), copyAttributesFrom(), copyMetadata(), eraseMetadata(), getAllMetadata(), getMetadata(), and setMetadata(). This is more efficient than calling getSection() and checking for an empty string. Definition at line 81 of file GlobalObject.h. Referenced by llvm::FunctionComparator::compareSignature(), llvm::NVPTXAsmPrinter::doFinalization(), llvm::HexagonTargetObjectFile::getExplicitSectionGlobal(), llvm::HexagonTargetObjectFile::getLutUsedFunction(), llvm::DataLayout::getPreferredAlignment(), getSection(), instrumentMaskedLoadOrStore(), llvm::AArch64InstrInfo::isFunctionSafeToOutlineFrom(), llvm::RISCVELFTargetObjectFile::isGlobalInSmallSection(), llvm::MipsTargetObjectFile::IsGlobalInSmallSection(), isKnownTypeIdMember(), isSuitableForBSS(), isUnmergeableGlobal(), maybePrintComdat(), llvm::TargetLoweringObjectFile::SectionForGlobal(), llvm::AVRTargetObjectFile::SelectSectionForGlobal(), and llvm::HexagonTargetObjectFile::shouldPutJumpTableInFunctionSection(). Definition at line 115 of file Globals.cpp. References assert(), llvm::GlobalValue::getAlignment(), llvm::GlobalValue::getGlobalValueSubClassData(), llvm::Log2_32(), llvm::Value::MaximumAlignment, and llvm::GlobalValue::setGlobalValueSubClassData(). Referenced by canCreateAliasFor(), despeculateCountZeros(), forceRenaming(), FunctionNumber(), getAlignment(), INITIALIZE_PASS(), instrumentMaskedLoadOrStore(), maybeSetDSOLocal(), replace(), selectJumpTableArmEncoding(), and SRAGlobal(). Definition at line 102 of file GlobalObject.h. Referenced by canCreateThunkFor(), canRenameComdat(), copyComdat(), llvm::createDeadArgHackingPass(), llvm::createX86RetpolineThunksPass(), FunctionNumber(), llvm::GetOrCreateFunctionComdat(), getOrInsertGlobal(), getRetComponentType(), INITIALIZE_PASS(), instrumentMaskedLoadOrStore(), LLVMSetComdat(), maybeSetDSOLocal(), and rewriteComdat(). Definition at line 70 of file GlobalObject.h. References assert(), getGlobalObjectSubClassData(), llvm::GlobalValue::getGlobalValueSubClassData(), and llvm::GlobalValue::setGlobalValueSubClassData(). Set a particular kind of metadata attachment. Sets the given attachment to MD, erasing it if MD is nullptr or replacing it if it already exists. Definition at line 1433 of file Metadata.cpp. Referenced by llvm::createPGOFuncNameMetadata(), hasMetadata(), instrumentMaskedLoadOrStore(), and selectJumpTableArmEncoding(). Definition at line 1439 of file Metadata.cpp. Change the section for this global. Setting the section to the empty string tells LLVM to choose an appropriate default object file section. Definition at line 188 of file Globals.cpp. References llvm::StringRef::empty(), llvm::Value::getContext(), llvm::LLVMContextImpl::GlobalObjectSections, llvm::GlobalValue::hasSection(), llvm::StringSet< AllocatorTy >::insert(), llvm::LLVMContext::pImpl, and llvm::LLVMContextImpl::SectionStrings. Referenced by assureFPCallStub(), createFPFnStub(), FunctionNumber(), getSection(), instrumentMaskedLoadOrStore(), maybeSetDSOLocal(), needsRuntimeRegistrationOfSectionRange(), llvm::WholeProgramDevirtPass::run(), and setUsedInitializer(). Definition at line 47 of file GlobalObject.h. Definition at line 39 of file GlobalObject.h.